1. (used with a plural verb) gymnastic exercises designed to develop physical health and vigor, usually performed with little or no special apparatus. 2. (used with a singular verb) the art, practice, or a session of such exercises. If you know me at all, you know I jumped right in and said yes! But then I was left wondering what to do. Mary helped hash it out with input from Jeremy and Caleb and we came up with phase 1 (so far) of our fitness challenge. I’ve done #plankaday (thanks so much – you guys rock) and I’ve done half of the 2011 pushup challenge (you ladies also rock) but this time we’re combining some stuff to make it more whole body-ish. Also, we’re looking to be leaner by ASHA in November 2013, so it’s called #ASHAFit13. New Year’s Day is DAY 1 – do a 10 second plank. Then add 2 seconds to your plank every other day (odd days). How to do a plank. Can’t hold the plank for 10 full seconds? That’s OK, do 10 seconds however you have to with brief rests – you’ll work up to blending them in no time. January 2 is DAY 2 – do 2 pushups (whatever kind you prefer). Then add 2 pushups every other day (even days). How to do a basic pushup. On knees (“girl pushup”) is optional and perfectly acceptable! By April 21, 2013 you’ll be able to do a 2 minute plank and 100 pushups – go you!! Then we maintain those (I honestly believe that 100 pushups and a 2 minute plank every 2 days is more than enough) and add lunges to the plank day and start to build those. But that will be phase 2 – we’ll work out those details later. One step at a time, right? We’ll keep you posted on how long or how many you should be at. Also, to keep it from getting boring, we’ll give you suggestions for ways to change up your pushups/planks/lunges. If you need to slow down, no problem. If you’re reading this for the first time on March 1st and you join late, no problem. Just do what you can do, build on it incrementally, and see where it takes you. You can leave a comment here with your myfitnesspal.com handle or tweet me, @mtmaryslp, @cmniece, or @azspeechguy with your handle and we’ll add you to the group. So, are you ready to get healthier and feel good? Let’s do this!! 2.a connected series of rooms to be used together: a hotel suite. 3.a set of furniture, especially a set comprising the basic furniture necessary for one room. 4.a company of followers or attendants; a train or retinue. No, you’re not in high school again and yes, you read the title correctly! I’m happy to participate in this great idea, but let me explain what’s going on. An SLP blogger, Teach Speech 365, started a chain letter, of sorts, of SLPs who blog. She created a series of questions and then asked some SLPs to respond on her blog, then they were to have 2 new SLP bloggers respond on their blogs and so on. Somehow I got asked to participate and so here we are (thanks for inviting me, Mary). Many of the SLPs have posted free downloads from their blogs and/or TPT stores but I don’t have any such thing. However, if you keep reading, one of my blogging SLP friends has a potential gift for you! I’m hoping you’ll take some time to visit Teach Speech’s site and track through some of these blogs to find new ones you like! Wait, did you hint that there’s a giveaway?? Yes, I did. Sean graciously provided a code for the Mr. Reader app. I’ll give it away randomly and to be entered to win you need to leave a comment by January 1st citing how you keep up with technology without becoming overwhelmed! I’m coming up on my 3 year anniversary on SpeechTechie. I first became interested in blogging when pursuing my 2nd master’s degree in Instructional Technology. I did this program online through a local college and it involved a lot of writing, which I really enjoyed. At the time, a few of my friends were using LiveJournal and so I started keeping a personal blog there, goofy stuff about TV and travel, etc. After being an SLP in the school setting for about 9 years, an opportunity arose to take a position as an Instructional Tech Specialist in the Middle School setting in my district. While there, I started reading a lot of tech blogs and using Google Reader extensively to follow these. I missed my day to day work as an SLP and the tech integration I had done in that role, so I decided kind of impulsively to start a blog to share ideas about these tools. I was really inspired by Richard Byrne’s Free Tech for Teachers, but wanted to do something that of course showcased websites through a “Language Lens.” I toyed with the idea of calling it SpeechieTechie, and am glad I didn’t! Too many “ies”=overly cutesy. I had no idea the response would be so positive. When I started, I only knew of about 3 or 4 others blogging about SLP work-Barbara Fernandes and Eric Sailers among them. It’s great that there are now over 70 blogs in the SLP Blogs Bundle! Elementary- High School Language and Social Cognition are the areas I feel most passionate about. I aim for 1-2 posts a week (been a little under lately but that’s definitely a goal for 2013), and I’d say the writing itself takes about 1-2 hrs weekly. However, I probably spend about 3 additional hours weekly reading blogs, twitter, and other resources to get ideas that can be “re-purposed” in the form that you see on my blog. I also blog for other people and do some writing that takes additional time, as does corresponding with people who ask questions, etc. So, I’d say about 5 hours total. Technology, clearly! Lately I have been focusing on iPad apps as there is obviously a huge interest in that area, but I also want to keep letting people know about what’s available on the web. You’ll note that I often don’t write about dedicated SLP apps (I do think they are terrific and I helped make some at Smarty Ears and also present on dedicated apps). However, I do get more excited about helping people think outside the box when applying apps, websites and technology in our work. My blog has clearly been gratifying to me and has actually become somewhat of a business of its own, opening the door to consultation and presentation opportunities that have allowed me to create my own job, to some extent. But the actual writing is a process I love, and it’s immensely rewarding to see and hear that people are reading and finding the information helpful. So, it helps me feel I am making a difference not only for other professionals, but for kids who struggle with language and learning disabilities as well. Hmmmm. Well, keep it brief (I don’t always succeed on this one). Use the technology well by providing links and images. Avoid drama and controversial topics, unless you like that kind of stuff (I do not). Schedule posts ahead of time so that you can write when you have time, and publish regularly. No idea is too small. 8. Add a question and answer of your choice. OK…How can SLPs keep up with technology without becoming overwhelmed?For this I will again mention the SLP Blogs Bundle (you can see a video tutorial at that link) and Google Reader, which syncs with iPad apps such as Mr. Reader, which I have provided a code for as part of this response. There are lots of great SLP bloggers writing about tech and non-tech areas in the bundle, and Reader lets you give it all a quick skim. The starring, tagging and sharing functions within the app will help you organize and access the information when needed, as well as connect you to colleagues (even just by sharing a post via email) that will help you see the value of being involved, even receptively, in social media. Started out in 2010, just wanted to share some of my ideas and the crazy things I did in therapy, with others. blogging- not as much as I used to. Probably once a month now, hopefully more often in 2013. Creating materials probably 3-4 times a week. Keep it simple and don’t bite off more you can chew. I still am yet to write a blog post that I promised ages ago. Life happens. Oh and have fun with it! 8. Add a question and answer of your choice (can be speech related or not).– What is your favourite thing to blog about? Mine is making therapy functional. Please drop a comment to share how you keep up with technology in this tech filled world! You could win a Mr. Reader app on January 1st! 1. a project undertaken or to be undertaken, especially one that is important or difficult or that requires boldness or energy. 2. a plan for such a project. 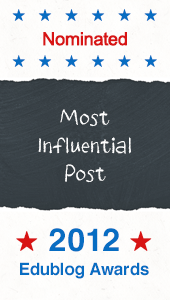 Firstly, I want to thank everyone who nominated me (@mtmaryslp, @atklingensmith, @SLP_Echo, and @deantrout) and also who voted for me in the 2012 Edublog Awards – I cannot believe that I came in 3rd for Most Influential Post; it’s mind blowing. I was also very proud of so many of my #slpeeps friends who placed or won their categories in the Awards this year. SLPs made such a strong showing that the Edublog Awards team mentioned them and it was suggested that there be an SLP category next year. I think this only proves how strong the community is that they rallied together and voted en masse, with no small thanks to people like @speechtechie for writing summarizing blog posts to help us know who in our community was shortlisted. While placing top five in my category for the Edublog Awards is nice, that’s not really the exciting news I wanted to share. You may have read Aubrey Klingensmith’s post about joining the team at Yapp Guru, a website launching in January 2012 that will help therapists and educators find the apps they need and also see what others like them have to say about it. When Mai Ling Chan first told me about her vision for the website, I was thrilled for her to get it up and running ASAP because there is such a need for it. I was impressed by her ideas and passion, as well as her thoughts on making it a part of the community since I’m all for anything that contributes to and helps build the SLP community, both on and offline. The weekend that Aubrey posted to her blog and revealed that she would be a partner in the venture as Director of Website Content Development, Mai Ling approached me to also participate in this venture with them (and others). I was blown away by the request! I took a full week to think about it and be sure it would be right for me, my family, and the company. Given my passion for social media and my addiction to love of technology, and after a lot of careful reflection and consideration, I’m VERY excited to announce that I am now Director of Social Media and Branding for Yapp Guru! You may or may not have noticed that when @YappGuru tweets (you follow us, right??) there is now usually ^M or ^T at the end of the tweet; I’m the T! I’ll also be the primary person for all of the social media presence for Yapp Guru. I’m really excited for what this website/company will be able to do for people using apps to help others! Even before I joined the team (or knew I would be invited to join) I knew Yapp Guru was going to be one to watch – you should watch/participate too! We’re on Twitter, Facebook, and Pinterest so far and sharing content primarily on apps for rehab and learning. Please connect with me there! 1. a series of interconnected events, concepts, etc. 2. the act of linking together or the state of being joined. At the recent ASHA convention, I was proud to volunteer behind the scenes and help organize the the Social Medial Learning Center booth. At both the booth and the Learning Lab that was offerred, they talked about why it is imperative that SLPs understand and embrace the world of social media that is taking our profession by storm. Whether you want to interact daily or prefer to sit back and listen, social media has become an invaluable resource for communicating with colleagues and staying on top of recent research and trends (as you well know if you read my blog – I can’t shut up about it). The booth and panel were both quite popular and visitors expressed an interest in learning more that they could take home with them to digest at their leisure. We anticipated that this would be the case, so several of us “#SLPeeps,” together with Heidi Kay at PediaStaff, co-authored and produced a simple e-book that we would like to share with you as a blog hop. If you are stumbling into this post midway into the e-book, please see the end of this post for all links in the blog hop. Shareka Bentham, a Barbadian SLT, and I wanted to take the increasing professional network of SLP/Ts on Twitter a step further, and created a discussion group called “slpchat” (speech and language professionals chat). While the #SLPeeps have constant discussion and interaction occurring on Twitter, #slpchat allows for a more structured discussion forum on a specific topic, at a previously advertised date and time (usually Sundays at 2 pm Eastern Time), moderated by @SLPChat – a profile created on twitter solely for that purpose. As moderator, @SLPChat poses questions to stimulate discussion and may suggest sources/resources, but does not provide definitive answers. The discussions surround a wide variety of topics in the field of communicative disorders. The chat has become so popular that, in February 2012, #slpchat began to be hosted a second time, running the same chat topic in the same weekend, from an Australian time zone – primarily moderated by Lauren Osborne (@speechieLO) from Sydney, Australia. Also, Bronwyn Hemsley (@bronwynah) at University of Newcastle, NSW, Australia helps out a great deal behind the scenes to support Lauren as well as the chat topics and blog posts. This expansion has allowed many more twitter users to participate in the chats, as well as more diverse topics with 4 people writing blog posts and taking the lead. Anyone in the speech and language field or anyone related to that field (parents, teachers, therapy assistants, etc) are invited to participate. 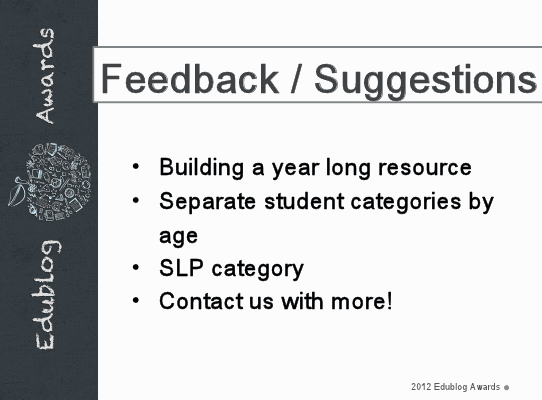 @SLPChat is also open to suggested topics for future discussions. 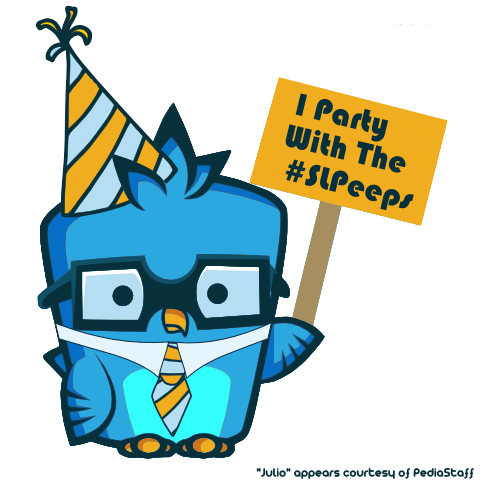 If you would like to participate in #slpchat, you must have a (free) Twitter account. Once you have a Twitter account you must follow @SLPChat’s tweets. Be sure to be on Twitter at the designated time (posted on the blog and on Twitter when chats are upcoming) and follow the #slpchat hashtag to participate in the discussion and see what everyone else is sharing. The only hard and fast rule for participation is that you include the #slpchat hashtag in EVERY tweet during the chat. This way, everyone can follow the chat and not miss anyone’s contribution. You do not need to follow everyone in the chat to participate and interact with them, so long as you tag EVERY tweet you make during the chat. Also, if you are tweeting ‘privately’ (your tweets are protected) you need to turn your protection setting off during the chat for everyone to see your tweets. Protected tweets don’t show up (even tagged) to your non followers and sometimes don’t show up to your followers either in a hashtag search. Search for #slpchat on Twitter (once you are signed in). You can then refer to this search (by clicking on the search bar and selecting it from the drop down menu) whenever you want. If you use Hootsuite or the old version of Tweetdeck, you can create a column based on a search. In Hootsuite, for instance, you would click ‘add column,’ (‘search’ and then type #slpchat as the search word). You will then have a dedicated column feeding only tweets with the #slpchat tag. You can use Tweetgrid to search for #slpchat in a column and even have more than one column (e.g. mentions, direct messages). Here is an overview of how to use Tweetgrid (thanks to @thecleversheep, Rodd Lucier, for posting this for his #educhat discussion group tutorial). Similar to Tweetgrid, you can use tweetchat.com to follow tweets with a particular hashtag. It will also remember to keep the hashtag in all your replies automatically so you can’t forget. During the chat, questions will be posed to get discussion going and keep it moving. People respond to the questions and begin discussing their responses. This is not a neat and tidy process. You can expect to see multiple responses at once but not in perfect order, since people take different amounts of time to respond and Twitter sometimes gets bogged down for a moment now and again. It will usually take a moment for someone to respond to someone else and others will have responded in the meantime. However, if you read the tweets as you go, you can make sense of it without too much trouble. A few times during the chat it may appear that no one is tweeting, but really Twitter is somewhat overwhelmed by the number of responses. Be patient for a minute or two and then the tweets will pop up for you to read. @SLPChat will continue to put forward discussion questions throughout the chat to keep everyone on topic (more or less) and keep discussion moving. You can subscribe to the SLPChat blog (slpchat.wordpress.com) to find out by email about upcoming chats so you don’t miss any, as well as visit the blog to learn more about how to participate in the chats and read various tips. You can also tweet @SLPChat, me (@SLPTanya), or @speechreka and ask questions at any time on Twitter. As many of you know, and maybe some of you don’t, Maggie McGary has been the Online Community & Social Media Manager at ASHA since May 2008. She is behind the @ASHAWeb and @ASHAConv handles and has been in charge of more or less their entire online presence (ASHASphere, LinkedIn groups, other member groups on the ASHA.com site, etc.) and has done a great job of keeping members and non-members abreast of all info SLP and AUD related in the online community. Maggie is leaving ASHA to take on a new role with the FDA. It’s a tremendous opportunity for her and we’re all sad to see her go but want to wish her well in her next position. Our community has become fantastic at supporting and showing our love and appreciation for each other. We’ve done it many times in the past. Let’s do a ‘sneak attack’ of appreciation and goodbye’s for Maggie before she leaves ASHA. Her last day is December 14th, but let’s start the outpouring December 5th. If you would like to donate to a group farewell gift for Maggie, please email Heidi (Heidi@pediastaff.com). Heidi will be signing the card for the gift “Best Wishes and Love from the SLPeeps” followed by the names of the people who contribute – so if you aren’t on Twitter, you can still contribute and be acknowledged! Also, Maggie’s ASHA email address is mmcgary@asha.org in case you want to send her a more personal (or longer) farewell. UPDATE: I’m making this post public now because I feel that most of you have provided your support to Maggie and word is out pretty strongly. Thanks everyone for showing Maggie how much we love and appreciate her contributions to the online community of SLPs and Audiologists.